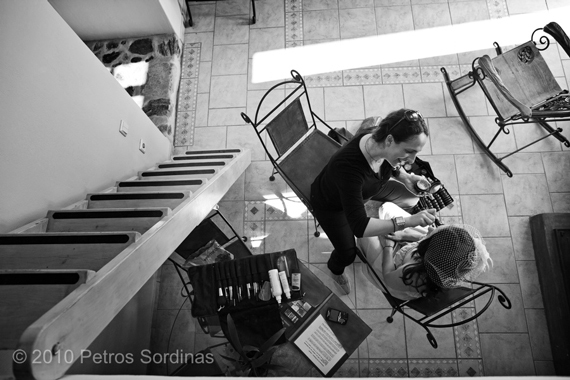 Renia Bledaki is a freelance makeup artist specializing in bridal makeup on the beautiful island of Santorini, Greece. She was born and raised on Santorini, leaving at 18 to pursue her ultimate dream as a makeup artist with studies in top make up institutions including the Make-up art Academy in Paris, Scuola di Trucco and Vivi Makeup in Rome and the Hugh Baird College in the United Kingdom. She has studied Asian Makeup as well as airbrush makeup techniques at Vivi Makeup in Rome, having graduated as one of the school’s best graduates. After 10 years of extensive on the job experience, she decided to return to the place where she gets her inspiration from and set up her own booming business, the wonderful island of Santorini. As well as being a make-up artist she is also a qualified skin care specialist, that enables her to advise on various routines and products that can help women maintain the health, radiance and wonderful glow of their skin. Having 18 years of experience in fashion and bridal make-up, Renia has a natural ability to bring the inner beauty out of each and every bride. Her beauty philosophy emphasizes the importance of healthy, glowing, flawless skin and being a qualified beauty therapist, she knows all the small secrets how to achieve that. She believes that the most important thing when doing bridal make-up is to make the bride feel as the most beautiful woman in the world on her special day. Renia uses top of the line make up ranges that include MAC, Bobbi Brown, NARS,Laura Mercier, Chanel and Smashbox. She also has an extensive range of airbrushing products that are ideal for flawless beauty in front of the camera. A team of talented and professional artists will make you put your best face forward. So whether it’s the bright lights, photography flash or simply your adoring groom that we are creating your look for, you can be sure that we have both the products and the experience to make you look your stunning self. Let us make you feel and look like your most beautiful self on your wedding day or any other special occasion!